One way to earn money on the Web is to sell online and start your e-commerce store. You can sell a wide-array of products online such as apparel, electronics, wine, information products such as eBooks and courses, and much more. Higher conversion and sales start with getting the right visitors to your website. It does not matter that you see spikes in traffic if no one’s buying. What you want to see is get more people who buy into your website. Make sure you attract qualified traffic or those genuinely interested in your products. Quality traffic means people who will do positive action upon arrival on your site. They buy your products, sign up for your newsletter, contact you, watch your videos, or peruse several pages of your website. The challenge is finding these high-quality visitors and making them go to your site. Do you have these products? If so, how prominently are they placed on your site? Why are the visitors not finding these products? Take note of the products that visitors are searching for that you do not carry. You may be missing out on sales opportunities given the demand for the product. Also, your users may be using different terms than what you have named your products. If so, consider adding those terms in your search dictionary or in the product description themselves. One of the best ways to increase your sales from your web store is to find products with huge demand that you can sell with good margins. Consider selling the hottest and trending products. There are a number of analytics tools that you can use to help you research on the best products to sell. These tools mine the Web and online marketplaces to give you data on price competition, trending products, top performing new products, among others. These tools are extremely useful in helping you shape your product catalog. Examples of these tools include Terrapeak and Trendosaur. You can also check out publications that track and report on emerging trends such as TrendWatching.com, TrendHunter.com, SpringWise.com, among others. If you want to earn more, expand your product distribution and sell your products in other places and not just in your own store. In fact, selling in online marketplaces particularly Amazon.com and eBay, where consumers can purchase from many retailers, are a must for small online entrepreneurs. Amazon.com is the leading e-commerce store and online marketplace today. If you’re not selling there, you are missing a significant part of the online buying population. More U.S. online shoppers look to Amazon.com first than any other e-commerce sites. Amazon.com’s massive customer base can give your business huge exposure to buying customers than you could ever hope to attract on your own. Consider establishing a strong presence in shopping comparison and review websites. Shopping comparison and review sites can help you get good visibility and exposure to high quality targeted traffic without the prohibitively expensive offline brand advertising. Try to get positive reviews on these sites. Start by encouraging your existing customers (especially your loyal customers) to write positive reviews on these sites. You can also ask for help from your friends and family, as they are likely to be your most ardent supporters. When sending order confirmation or thank-you-for-the-purchase emails, you can add a little note requesting your customer to review your site. You can also send stand-alone emails to customers requesting for their help in getting more reviews in shopping comparison and review sites. Email is a powerful and must-have tool for e-commerce. You can use email to generate sales, to build awareness, to keep customers coming back to your site, and to engage and strengthen your relationship with your customers. Email is an effective tool for generating immediate action, whether you want sales, registrations, downloads, inquiries, and others. You can use it to keep your business at the top of your customers’ minds, which is essential in generating long-term sales. It also allows targeting and segmentation of your customer list, enabling you to send information about products your customers really want. 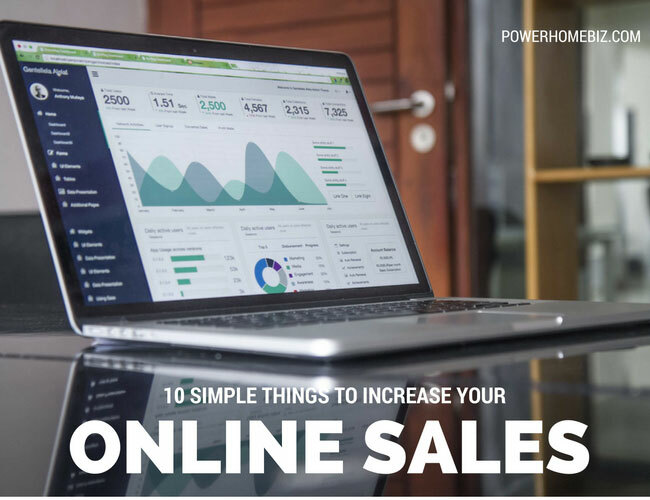 Plus, it offers you loads of data that you can use to increase your sales. Mobile represents the biggest shift in commerce in recent years. To succeed today, your business needs to be easily accessible on mobile devices. These includes smartphones, tablets, wearables and other Web-connected devices. Mobile commerce should be a key part of your strategy. If your business is mobile, you allow your business to be accessible at all times from virtually anywhere. Smartphones are ‘always on’ devices, with users carrying them all the time wherever they go. Many consumers own smartphones and access the Internet through their devices. They research products to buy, play games, read, and yes, shop on mobile devices. Some shoppers also research products on their mobile devices and buy them on desktops or offline. Success stories work. That’s why infomercials always use illustrations of the success of their products. When selling online, you need to convince visitors that your products work. Potential buyers want real-life proof that your products are what you say they are. And the best way to show that is to let happy customers do the talking through testimonials! Testimonials tell your visitors that you deliver what you promise. They are powerful word-of-mouth tools to show others that customers love your products. In fact, they’re singing your praises! Buyers are more likely to believe what others have to say than the blurb in your product descriptions. Your customers are more persuasive than you in convincing others to buy your products. Visitors are not always arriving on your homepage. Many come to your site via your product or other interior pages, yet this fact is often one of the most neglected sales points. In fact, where you send your visitors can be key to increasing your conversion rate. Check your web statistics and find out your main landing pages, ensuring that they are able to engage visitors. Then consider adding a graphic in these top landing pages that succinctly explains what your website is all about. If you want to sell more, you need to know what’s working and what’s not. Sometimes you may have a hunch that something on your site is not right, or you may just want to try something new. The only way you can do this is to test. You need to test everything in your site to help you determine what you can improve and remove anything that is impacting you negatively. Testing can give you insights that can drive sales. Before launching your site, be sure to conduct usability tests. You need to evaluate the features and functionalities of your site. Check if your site is user-friendly and intuitive. You need to test for its responsiveness, cross browser compatibility and navigation. Your goal is to find any stumbling blocks that prevent you from retaining your visitors and hindering them from buying. Dear admin thanks for sharing such information .Your article is very useful. so many interesting things. Increasing online sales is something you can write a book on. All the mentioned tips are absolutely correct, I would like to add a little more on that. in order to increase sales, you need to attract your customers and this can be done by offering coupons, promotions, and discounts. this will force your customer to buy goods from your online store.